Can somebody post here who works on machine from Trumpf: Trumatic L3030 or on other model? I serve such machines, what questions at you? I like to know how can i cut Inox material. Can somebody help me to find documentation for manual operation and maintenance for L3003 ,L3030 or other model? 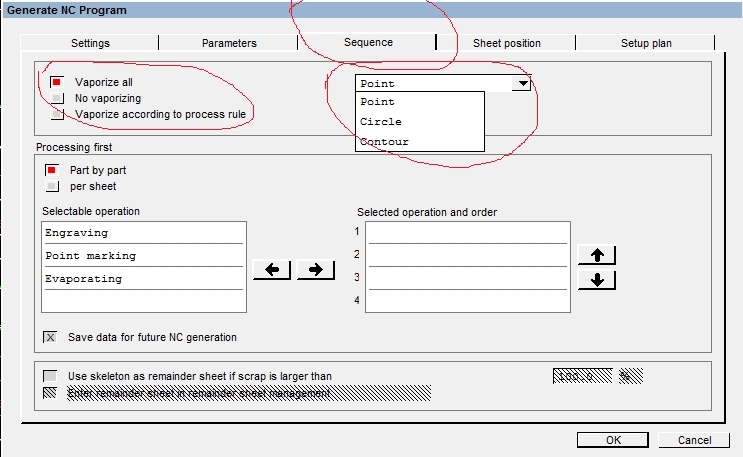 modul Laser - extras - modify data ... - laser - technology table selection (select) - OK - continue - vaporize, and this edit. Pas tol where are you from ,how long you work with trumpf machines with who models of trumpf? My question is how can set best focus for cutting material.Can somebody sent me books for setting focus ,or explain here? You must have calibrated the cutting heads and focus in parameters is +- 0.5 mm best focus for cutting this material!!! But even so, you learn set best focus just of practice... LEARN!!! my settings is diferent from yours on picture becouse i use softver: TruTops Laser v.6.What version you use ? In TruTops Laser v.6 i set ... and i see on simulation that is ok ,cutting is how i like: first foil and than inox but when i insert program in machine show me msg that techology is not found. Maybe problem is in TruTops Laser v.6?this softver maybe cant make program for cutting first foil and than inox? Or maybe i insert wrong laser tabell in machine for cutting inox but i dont belive becouse i insert parametars from book of trumpf. Somebody can tell me who parametars need to be insert in machine for cutting inox with foil? "picture is for example i like to know who parametars i need insert there for cutting inox with foil"
hi, you have mashine bosch cc 220, insert laser tabel, laser tabel include 2 page, more users uses 1 page. and need focus for data collect. what model, year manufactured, resonator kWt ? I work on laser machine from Trumpf. Need me help about cutting inox. Somebody have experience with EEPROM ,PLC? Need me somebody who work on TRUMPF laser machines. I am looking for more information about trumpf tc 7000. I know how to programming tc6000 and i'll like to know what its&are new function (difference) in this tc 7000.